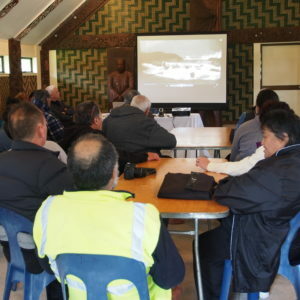 Whānau at the September 2016 Hui-ā-Hapū watching the flood history video. Videos of all Marae Options Hui-ā-Hapū are available to members to view from the members only page. This page also contains professional Tangoio flood history videos, handouts, a map and powerpoint presentation slides available to download. To access the page click here and enter your login details. If you have any problems, please contact us on info@tangoio.maori.nz or 06 835 3300.